If you have finished the challenge at whatever level you signed up for, and if you did a wrap up post, please enter a link to your wrap up post here. Please link to your wrap up post, NOT the main page of your blog. I was sure I posted this earlier last year, but just in case I'll re-post my wrap-up reviews. 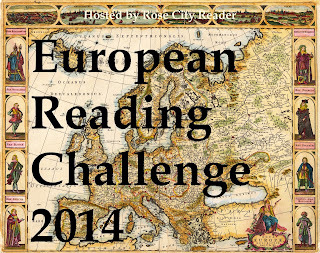 This was my first Reading Challenge, and boy did it get me addicted! I've posted my wrap-up. It's possible I'll sneak in another European read before the end, but not likely (12 is pretty good for me!). I read five and my goal was four, so that was good! I only reviewed two of them though, so that wasn't so good. Thanks again for hosting! Thanks again for hosting this challenge. It's always fun to find different countries to read for.